All existing gamblers from the UK can qualify for this deal. 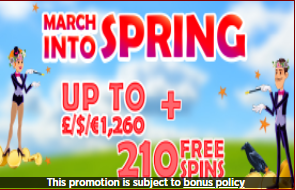 Deposit at least £20 at Lucks Casino using the code 20FS and you will receive 20 Spins. You can claim this bonus 3 times during the promotional period. These are valid only on Psycho. Spin the reels on this slot and enjoy your time. Play through the bonus amount 50 times before making any withdrawals. Keep in mind that you can’t cash out from this offer more than £20. This promotion ends on 31st of March so hurry up and claim it!